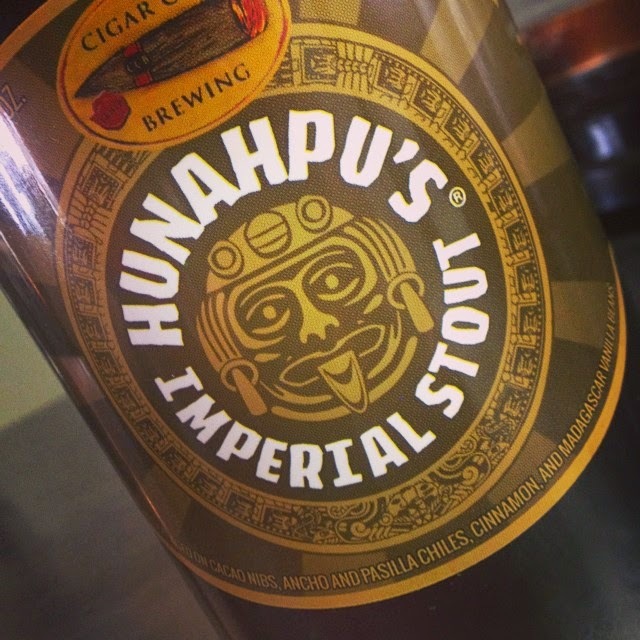 Yesterday, I saw on The Revolution Ice Cream Company’s facebook page that they had created a new ice cream flavor – Cinnamon Brown Sugar Ice Cream with Cigar City’s Hunahpu’s Imperial Stout. Just in case you don’t know about this beer, it is Cigar City’s most sought after beer. They brew it just one day a year, and release it the second Saturday in March at the brewery. The Hunahpu’s Day event has become so popular that they had to start charging $200 per ticket to keep the crowds under control. The beer made this list of The 10 Most Traveled For Beers in America and it has a perfect 100 score on Ratebeer. It gets its name from the legendary Hun Hunahpu of Mayan mythology. Hunahpu was slain Dark Lords of the underworld, and his sacrificed body morphed into a cocoa tree, with a cocoa pod as his head. One of the Dark Lord’s daughters, Xquic, picked a fruit from the tree and it spat on her, impregnating her with twin sons. The twins grew up and defeated the Dark Lords to avenge their father, then transformed into the sun and the moon. The stout is aged on cocoa nibs, ancho and pasilla chiles, cinnamon, and Madagascar vanilla beans. Unfortunately with it being so rare and the event being so expensive, I’ve never had the chance to taste it, but it sounds incredible. The line at the ice cream parlor was longer than I’ve ever seen it. It seems that the word spread about their one batch of the cinnamon flavor – although it wasn’t marked on the board with the rest of them. Lance and I each got a scoop of it – plus I had a scoop of their Mocha Mint (coffee ice cream with Thin Mint cookies), and Lance had a scoop of the What’s Up Nutter Fudger? (chocolate peanut butter ice cream with chunks of nutter bars). All our flavors were delicious. I’m glad we were able to try the special flavor because the stout made the cinnamon ice cream even richer. I still wish I could try a sip of the beer on its own, but the ice cream was great. If you want to read more about The Revolution Ice Cream, check out this post from last September. They constantly have events and come up with new flavors, so like their facebook page if you want to stay updated. Coming up on Sunday, April 12th from 1 – 7pm, they will have food trucks, live music, a bounce house, and BOGO ice cream all to benefit the Center for Autism and Related Disabilities (CARD) at USF, so if you’re free that day, go eat some ice cream for a good cause. The Revolution Ice Cream Company is located at 220 W Brandon Blvd #104, Brandon, FL 33511 and is open 12pm – 10pm Monday through Saturday and 1pm – 9pm on Sunday.